The valedictory function of two-day seminar on “Women Empowerment and Human Rights with special reference to North East” was held at the Court Hall of Manipur University on Saturday. 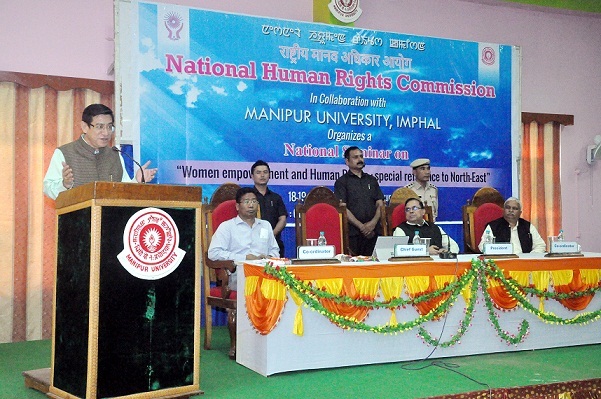 The seminar was organized by National Human Rights Commission (NHRC) India and Manipur University. Justice N Kotiswar Singh of Manipur High Court, Prof Adya Prasad Pandey, Vice-Chancellor of Manipur University, Dr S K Shukla, Asst Director, NHRC and Prof N Lokendra Singh, Director, Centre for Human Rights & Duties Edn, Manipur University attended the function as chief guest, president and coordinators respectively. The function started with the welcome speech by Dr SK Shukla followed by seminar report presentation by Prof N Lokendra Singh. In his report, Prof Lokendra said there were four academic sessions and twenty six papers presented during the two-day seminar. Delivering his speech, Justice N Kotiswar Singh said Manipur University is the place of shaping ideas and can direct the society. The autonomy of the university is not limited to its functioning but also to the free flow of knowledge and ideas to the society. Justice Kotiswar further elaborated on the preamble, constitution of India, rights, duties and directive principles of state policies and also urged all citizens to be fully acquainted with it. In his presidential speech, Vice Chancellor Prof Adya Prasad Pandey said the debate of gender discrimination has been going on for a long time. So many awareness programmes and seminar have been conducted in this subject but the issues of violence against women still persist in our society and the main reason is the attitude we posses, he added. He called for the need to spread the awareness all over the country. Dr Sureshkumar Singh, Centre for Human Rights & Duties Education Manipur University also spoke on the valedictory function.